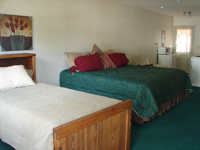 Max Occupancy: 3 Duplex with 1 king bed and 1 twin bed. Full kitchen, microwave and coffee machine. Shares back deck with Duplex 3.